Who Owns the Market Data? Browse: Home » 2017 » September » Who Owns the Market Data? At last week’s STA Market Structure Conference, the topic of market data costs was brought up repeatedly. Even though most folks at the conference believe that market data costs are too high, the stock exchanges seem to believe that they add a lot of value here which is why they charge such high rates for market data. This made us think about the question: who owns the market data? We thought we would walk through a few investment scenarios and then ask that question about each scenario. Portfolio manager decides to buy a stock after spending hours of time on research which includes reading research reports, talking with analysts and calls to the company. The PM decides to allocate a small portion of the funds holdings to that stock. The PM then sends a buy order to his trading desk using a trading benchmark such as arrival price. The buyside trader then makes a decision on how to trade the order. They might try to source block liquidity, work it themselves through a broker algo or send the order to an agency broker like Themis Trading. Either way, the institutional order will enter the market and add to the price discovery process. Who owns the market data? A retail investor walks into a local electronics store one day and sees that the store is nearly empty. The investor recalls not long ago when the same store was jammed with customers buying the latest electronic gadgets. After doing some research online, the investor realizes that these big box retailers are rapidly losing share to the online marketplaces. The retail investor decides to put on a small short position of the electronics retailer. The stock doesn’t trade very actively and the current market is $25.10- $25.35. Rather than just hit the bid, the retail investor decides to tighten the spread and post an offer on an exchange at $25.20. Another investor sees the new offer and decides to buy the stock at $25.20. Who owns the market data? To take advantage of the Fed-induced free money frenzy, a corporate treasurer decides to issue debt at a very low interest rate. Rather than using the proceeds to expand a plant or hire new employees, the company decides to buy back their own stock. Using strict SEC 10b-18 timing, price and volume rules, the company begins to execute the buyback through a trusted broker like Themis Trading. Who owns the market data? Using exchange individual-order proprietary data feeds, colocation and special order types, the HFT anticipates price changes and jumps ahead of orders like in the above three scenarios. These HFT predatory traders also use latency arbitrage strategies to take advantage of the fragmentation of liquidity that the exchanges have helped create. This unnecessary intermediation actually takes away from the price discovery process by moving stock prices that might not have moved if there was no HFT intermediation. Who owns the market data? We would argue that stock exchanges do not own the market data in Scenarios #1, #2 and #3 since these orders were driven by investors. The exchange had nothing to do with the investment process. They simply facilitated the orders by providing a place for them to trade and for that service they deserve a transaction fee. We think this exchange function is similar to a public utility and should be regulated and priced like a utility. However, the exchanges might have an argument that they own the market data in Scenario #4 since the HFT predatory trader needed the special services that only an exchange can provide. 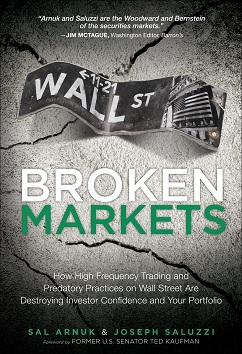 Without colocation, access to individual orders via exchange proprietary data and special order types like post-only, the HFT predatory trader would probably not have traded the stocks. In other words, the exchanges are correct – they do facilitate predatory HFT trading and therefore they do own the market data associated with predatory HFT trading. The next time you get an exchange market data bill, please think about what you are paying for. Are you paying to see your own data? Are you paying for the data generated by HFT traders who picked off your order and increased your transaction costs? Our contention has always been to eliminate maker/taker and let the exchanges charge an access fee for both sides of a trade (similar to IEX which doesn’t sell market data feeds) as this would reduce the conflicts of interest (e.g., information leakage, rebate arb and predatory trading). The exchanges could get paid for their function of matching buyers/sellers and buyers/sellers would price stocks based on supply/demand and suffer less adverse impact from proprietary traders seeking to benefit from their order flow. While exchanges might have contracts that claim they own the market data, we think that the above scenarios question that assertion and question the value of market data.